In the 18C and 19C there was a cluster of Dumvil(l)e watch- and clockmakers in the county of Cheshire in the north of England, and a second cluster in south-east England, mainly in and around Cambridge. From time to time clocks and watches by a Dumvil(l)(e) come up for sale, and we know Stockport Heritage Library has a watch by Nathaniel Dumville, watch and clockmaker of 93 Lower Hillgate, Stockport. John was baptised in Marton, Cheshire on 3 October 1720, son of John and Ellen Dumville. He married Mary Ward on 4 January 1751 and they had several children: John, William, Nathaniel, Sarah, Peter, Mary and Ellen. John died in 1796. His wife Mary had died in 1778, and William and Sarah predeceased him too. 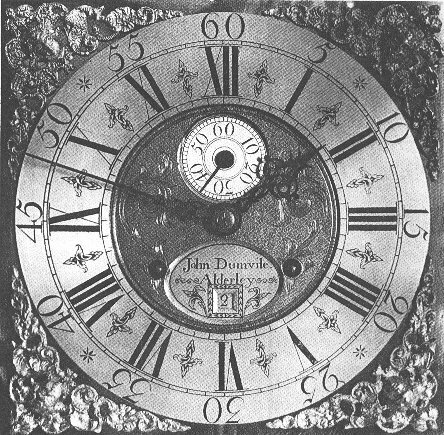 John's work included longcase (grandfather) and church clocks (e.g. at Nether Alderley, Chelford, and Goostrey churches, Cheshire, England). 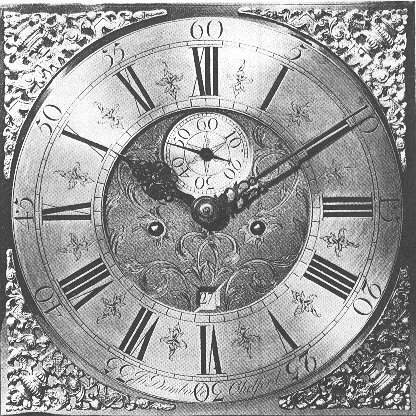 His signature on the dials ranges from J. Dumbvile (c1750) to John Dumvile (c1775). For some of the many listed references to his work, see below. John was buried on 11 December 1796. Nathaniel, Peter, Mary and Ellen outlived him, and are mentioned in his Will, signed by him on 6 December 1796. Probate was granted 30 January 1797. The Will indicates a flourishing business. He left much of the business to his son Nathaniel (c1759-1839), who had already followed him into clockmaking, and was based mainly in Wilmslow. Nathaniel had married Rebecca Gibbon in 1791 in Wilmslow. Their son Nathaniel (c1793-1842) later became a clockmaker, as John obliquely anticipated in his Will. John had hoped that another grandson, Peter's son Cyrus (then aged about 13), might also become a clockmaker, but Cyrus became a farmer instead. unto my son Nathaniel Dumvile and his Heirs during the Lease with liberty to renew if Sir John Stanley Bart. pleases. A brass dial signed by J. Dumvile, Alderley, led Roy Jackson to describe in Poynton Local History Society newsletter (date unclear) how he restored a friend's longcase (grandfather) clock. A dog had knocked it over, badly damaging the fine oak case and hood. Roy researched the clock's age and origins with the help of the Cheshire Record Office Archivist. Copies of three articles plus John's Will revealed that John Dumvile had made a 'chair-frame turret clock' dated 1775 for Chelford church and one in 1794 for Goostrey church. "The clock movement I restored was one of his early ones or, maybe, he did not make many domestic clocks. The front plate of the clock had all the markings on to indicate where the wheels would be positioned. Normally the clock maker would first make a pattern or template and future production would be from the pattern, so avoiding marks on the actual clock." From the tools he left [in his Will] it is clear he must have been self-contained as a clockmaker, not relying on others to make parts. He must also have done his own engraving, because the signature on the clock dial is his type of signature on the Will. The clock gives indications of being over 200 years old. After some restoration it is again ticking away, giving the correct time, without the aid of batteries." Footnote: Bagshaw's Directory 1850 entry for Nether Alderley mentions two Dumviles: Jane Dumvile, schoolmistress, and John Dumvile, harness and saddle maker (at Monk's Heath). John (1720-1796) had a son and grandson, both called Nathaniel, and both clock and watchmakers. The son was born about 1759, died in 1839 and was buried on 7 March 1839 in St Mary's churchyard Nether Alderley. Many other Dumvil(l)es are buried there too, listed in the National Burial Index [NBI]. He had married Rebecca Gibbon on 2 June 1791 in Wilmslow. Their son Nathaniel, John's grandson, was born about 1793, but outlived his father by only three years. The younger Nathaniel's Will, signed in a shaky hand, was written on 8 September 1842 and he died the following day. Nathaniel senior (c1759-1839) seems to have spent his working life in Alderley and Wilmslow: 'Nathaniel of Alderley and Wilmslow', while his son Nathaniel (c1793-1842) moved a little further away to work in Stockport: 'Nathaniel of Stockport'. There were other contemporary Nathaniel Dumvil(l)es too, and it's not always clear which Nathaniel is being referred to! Clockmaker expert Keith Appleby lists Nathaniel Dumville as working in Stockport 1816-41 (c1825 at 93 Lower Hillgate), and N. Dumvile in Wilmslow 1828-39. Loomes lists Nathaniel as working in Stockport 1834, Baillie lists Nathaniel Domvile (sic) as working in Stockport 1820-42; Nathaniel Dumville in Stockport 1830-33. "An oak and mahogany longcase clock, the square enamelled 35cm dial with Roman chapter ring and floral spandrels, subsidiary seconds and calendar dials, inscribed 'N. Dumvile, Wilmslow', eight day movement, striking on a bell, the square hood with brass mounted swan neck pediment and fluted freestanding pillars, shaped ovolo moulded trunk door flanked by reeded and strung pilasters, the canted moulded base with planted re-entrant panel, 213cm high." "Nathaniel Dumville was a watch and clockmaker of 93 Lower Hillgate, Stockport. He was in business early in1823 (when sentence of death was recorded on one Thomas Yates for stealing a watch from Dumville) up to 1841 according to local directories. 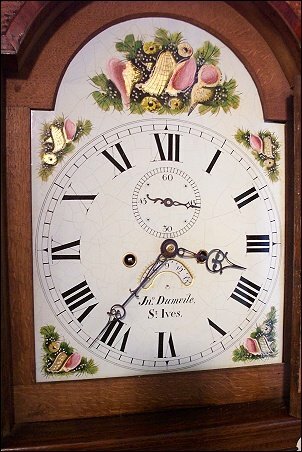 He is mentioned in Baillie's Old Clocks and Watches and their Makers: Nathaniel Dumvile, Stockport 1820-33." Was this Thomas Yates related to Nathaniel of Stockport by the marriage in 1822 of Martha Yates to the distantly-related Nathaniel Dumvile (1796-1843) of Chapel-en-le-Frith, Derbyshire? Incidentally, the same day, 19 February 1822, Ann Yates married Samuel Mellor! A double wedding? "A GEORGE IV SILVER PAIR-CASED VERGE POCKET WATCH by Nathaniel Dumvile Stockport, number 6706, with white enamelled dial and Roman numerals the case hallmarked Birmingham 1822, estimate £100-£150 (George IV's reign: 1820-1830)." After his death in 1842 Nathaniel the younger's business successor was H.J. Fairbrother, also of Lower Hillgate. 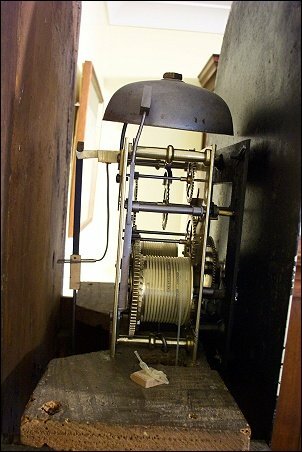 One Fairbrother clock is recorded on the Internet as being made in about 1810. A note on Nathaniel's Will says that his daughter Mary became Mary Fairbrother after his death in 1842 and before probate was granted in 1844. Although the 1796 Will of clockmaker John went into detail about disposal of his clockmaking items, in 1842 the younger Nathaniel refers simply to his 'stock in trade'. He was only in his early 40s, but he had plenty of assets to share between his children, some of whom were still under 21. 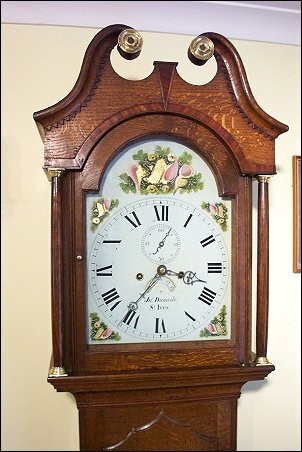 A few years ago a beautiful antique oak longcase clock came up for sale on the Internet. Dated c1830, with an estimated price of £4,950, it was signed by John Dumvile of St Ives. That's the St Ives in Huntingdonshire, not Cornwall. Both John Winter Dumvile (1771/72-1847) and his son John (1801-1881) were watchmakers in St Ives. The clock could have been made by either, but I think it more likely to have been the senior John, who remained in St Ives while his son moved to spend most of his life in Cambridge, and seems to have preferred the spelling Dumville. Alas, says Legg, most failed to achieve such success. Olney was, though, a particularly significant watch- and clockmaking centre in Buckinghamshire. By 1798 there were eight watchmakers in Olney compared with only five at Aylesbury, the county town. In 1799, when John Winter Dumvile (1771/72-1847) married Mary Perry in Olney, Buckinghamshire, his parish was given as Ashwell, Hertfordshire, some distance from Olney. Ashwell is a picturesque village in north Hertfordshire, some 45 miles from the centre of London, and a few miles from the A1(M) motorway. Ashwell springs are one of the sources of the River Cam. For many centuries Ashwell had been an important market town, but it was in decline, and by 1799, the year John married, there was no longer an official market, perhaps a significant reason why the young couple moved away to St Ives. St Ives in 1800 was very different from the quiet little backwater it is today. In the mid 19C its weekly Monday market was said to be second only to that held in Smithfield, London, in size and importance. Goods traded covered a wide range of agricultural produce, and it was a major centre for drovers bringing cattle and other livestock from Scotland, Ireland, the north, and Wales. There was plenty of money around for luxuries like watches and clocks. John and Mary lived in Bridge Street, St Ives, near the picturesque bridge, an important crossing-point over the River Ouse. I wonder if John had anything to do with the landmark clock tower erected in Bridge Street in 1802? Noel Hudson's book 'St Ives, Slepe by the Ouse' (published by St Ives Town Council, 1989) says the clock's maker was officially recorded as John Briant, Hertford. Noel Hudson also mentions that from 1796-1930 the local Skeeles family kept detailed notes on life in St Ives. I wonder if they mention the local watch- and clockmakers? A typed copy of the notes is now in the Norris Museum, St Ives. John Winter Dumvile's eldest son John took his watchmaking skills to Cambridge, not far from St Ives. 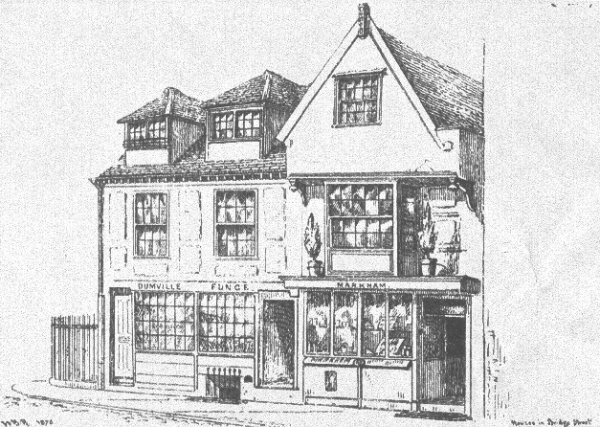 An 1876 sketch of his premises at 61 Bridge Street appeared in W B Redfarn's 'Old Cambridge' (below, sent by Anthony Dumville). The shop was later pulled down to build St John's College in 1938. According to Loomes (qv), John's work in Cambridge covered the period 1830-1875, at least. John and Mary's son James stayed as a watchmaker at 11 Bridge Street, St Ives. According to Loomes (qv), James' work covered the period 1839-1864, at least. The 1851 census shows he then had two employees. Reference books list watchmakers and clockmakers with dates showing when they were known to be working, but this can be confusing. For instance Loomes has two separate John Dumvil(l)(e) entries, one working in Olney, and one working in St Ives, but they do in fact both refer to the same man. So please treat these lists with caution! I have added N (north) and S (south) to show whether the person is in the north or south of England group. Dumbvile, John; Chelford, Clockmaker, mid 18C (N): Ernest L Edwardes illustrates a clock in his 'The Grandfather Clock', book plate 749? "Mr Ernest McConnell, of Carlton Street, Moss Side, wishes to know the date of a clock by J Dumvile, Alderley, and also information about its maker. It has been in his family for three generations." "C.M. of West Kirby enquires as to the age of an oak cased 30 hour clock with brass dial. On an oval brass nameplate is the inscription Jno Dumvile, Alderley. The writer's grandparents from whom the clock descends live in Alderley." Cheshire Sheaf's Editor replied: "John Dumvile, of Nether Alderley, clockmaker, died about 1797, in which year his will was proved at Chester. The clock is probably a good deal earlier than this, possibly 1750." Dumville, Nathaniel, Stockport, Clock- and Watchmaker, Stockport, Hillgate 1816-41 (N). See article, Cheshire Sheaf, 10,596. Several black and white plates, and notes about the northern clockmaker, whose signature on the dials changes from J Dumbvile (c1750) to John Dumvile (c1775). Legg states: "Dumville, John: watchmaker of Olney, was included in the returns of the Posse Comitatus for Buckinghamshire in 1798. He married Mary Perry on 28 February 1799."